Hudson Street Press, 9781594630842, 288pp. Like "This I Believe," StoryCorps's "Listening Is an Act of Love," and "Tuesdays with Morrie," "30 Lessons for Living" is a book to keep and to give. Offering clear advice toward a more fulfilling life, it is as useful as it is inspiring. Karl Pillemer, PhD, is the founder and director of the Cornell Institute for Translational Research on Aging, a center that works to increase public awareness of aging research. Dr. Pillemer has authored more than one hundred scientific publications, and has spoken widely throughout the world on issues of successful aging, family relationships, and elder care. "Thank you, Dr. Pillemer, for gathering all this wisdom in one book before it is lost. I can't imagine anyone whose life will not be enriched by this book." "The 'Wisest Americans' have a lot to teach the rest of us. Some of this advice is refreshing common sense. Much of it is truly surprising. It is always heartfelt and ever-endearing - equal parts information and inspiration. This is a book to keep by your bedside and return to often." --Amy Dickinson, nationally sundicated advice columnist "Ask Amy"
"This is a fabulous book! 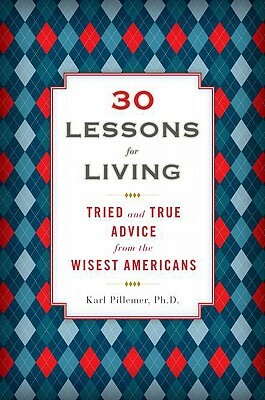 Karl Pillemer has done an incredible job of bringing together the collective wisdom of hundreds of Americans into an entertaining, thought provoking, and practical book. Give it a read. You will find yourself getting out of bed in the morning with new enthusiasm." "30 lessons for Living is an absolute gem! Thank you Karl Pillemer for taking the time to collect such a valuable trove of wisdom, and for sharing it with us in such a readable book. It's one that I'll recommend often. All of it is wonderful, but I particularly appreciated the lessons on honesty and saying yes to opportunities. Read this book - you'll get more out of life and have fewer regrets." "If you want to hear the wisdom of the aged, this easy-to-read book, based on years of penetrating interviews by a prominent sociologist, tells you what they have learned about love, work, marriage, and parenting." "For five years, Karl Pillemer sat down with more than 1,000 older Americans-most of them between the ages of 70 and 100-to talk about lessons for living well. In the resulting book, 30 Lessons for Living: Tried and True Advice From the Wisest Americans,... Pillemer, a gerontologist at Cornell, has culled 30 life lessons from his "experts," ranging from the practical to the profound. How to raise children? How to think about dying? Think of this book as 1,000 borrowed grandparents weighing in on life's various challenges. A salty pragmatism runs throughout." "The author skillfully weaves a prevailing theme (e.g., parenting, aging fearlessly) with self-disclosing statements from interviewees to create a compelling, inspirational book."